Have I Found My Forever Email Sending Platform? SendyHosting.com offers support and infrastructure for the Sendy Hosting app at a reasonable cost. If you’re an indy author, you need a mailing list or you’ll be at the mercy of Amazon, BookBub, and FaceBook to get news of new releases out to your customers. Unfortunately, if you only publish once every six months a mailing list can become expensive to maintain. I started out collecting emails in a spreadsheet, graduated to MailChimp and took advantage of their free program, and then started their pay-per-email plan so that I could take advantage of auto-responders. By paying $250 I was able to get the cost-per-email to $.01. With only a few subscribers a day, and less than one email send a month, that was not too bad. 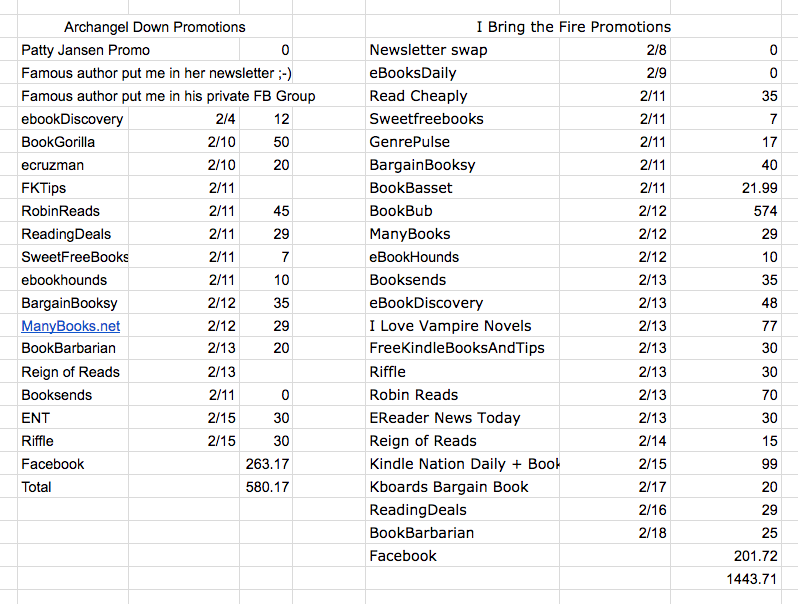 … and then my list ballooned. My list is at 7,000 subscribers (and I’ve got another 4,000 who aren’t very engaged that I hit up every now and then … plus a secondary list dedicated to Box Set lovers that is growing fast.) Sending an email to 7,000 subscribers at .01 a send is $70. For that many people, MailChimp’s monthly plan isn’t any better–it’s $75 a month for a list that size. After researching other popular mailing list management apps I discovered Sendy. After an initial investment of $59 Sendy costs $1 per 10,000 emails sent. So what’s the catch? There’s actually a few. There are no preconfigured email templates and its WYSIWYG editor is very rudimentary. You can download free HTML templates from places like Litmus, but still, if you don’t know HTML it can be tricky. Segmentation is rudimentary at best. Want to send an email quickly just to those folks who enjoy your sci-fi? Ha, ha, ha … no. You can create custom columns in your list to store details like that, but to send to those people you have to export your list, fish out the folks who fit that criteria, create a new list and send your email. (In its favor, if they unsubscribe, Sendy will take them off the original list.) Sendy does allow multiple lists … but that gets clunky too. I noticed I had customers signing up for both my sci-fi and urban fantasy lists. I’m glad they like both–but I don’t want to annoy them twice with every release announcement. 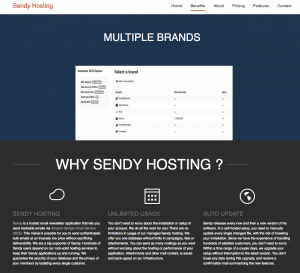 On a whim I Googled “Sendy Hosting” and discovered … dun, dun, dun … SendyHosting.com and EasySendy.com. I eventually went with SendyHosting because EasySendy seemed really geared to upselling peeps to EasySendy Pro. It looks like an awesome powerful product if you’re sending out 100,000 emails everyday (Comcast is one of their customers). It also looked really complicated when I signed up for a free account and poked around. Like it-could-be-a-job-just-to-know-how-to-use-it-complicated (if you’ve ever worked at a big company like Comcast you realize sending emails is someone’s job. They do it all day everyday. Have respect for them. It’s a job that takes marketing savvy, and techie and analytical brains.) I just want to send one or two emails a month. (If your’e looking to become the next BookBub, maybe it’s for you though?) To be fair, they did offer me free webinars and support … but I don’t want a webinar, I want to jump in and start sending. So, with some trepidation after already trying two different email sending apps in a month I signed up for SendyHosting. It was so easy. And at €12 a month affordable! That cost includes security updates to Sendy … I hadn’t figured those in; but as I would have to pay for their installation, it probably would have been more expensive than Sendy hosting in the long run. I had to create a subdomain for them, and grant a few permissions to AWS (Amazon Web Services, Sendy is their product.) But I was able to do it in minutes and I was right back with the interface I was comfortable with. If you are comfortable with HTML and you need a cheaper email app, Sendy might be for you. But check your web hosting provider–they may not allow it–and even if they do, a Sendy hosting plan like SendyHosting.com might be cheaper in time and / or money in the long run. I a still have a $.01 a send MailChimp service to catch anyone who has a link to my sign-up forms, and for Instafreebie sign-ups, but I HOPE that I’ve found my forever plan for general sending. In the web design business we have a saying, “Don’t make me think!” Basically, it means that all interfaces should be as easy to use and intuitive as possible. Web designers who try to be “too cool” are really saying,”This is all about MY VISION of DESIGN and I don’t care about you!” I wonder, if when we make things difficult for readers, we are inadvertently saying, “My ART is so wonderful, it’s worth struggling to discover”? Recently, I was reading a self-pubbed writer bemoaning that her series (and she has multiple series!) don’t sell well, despite good reviews, and the fact that she has been traditionally published in the past and has industry cred. I was curious how someone with so much going for her could be floundering. So I went to her author’s page on Amazon. I couldn’t find which of her 20 or so books were part of a series, and which were one-offs. I wondered, how many of her readers couldn’t find the next book in their favorite series either? How many clicked away in dismay, and how many sales were lost? So here’s three tips–two easy, one hard–to make sure your fans know your series has continued. 1. Put the series name in the title not just on your cover in the actual metadata when you enter the title on Amazon. Your book cover is going to be postage stamped sized in the browser window until someone clicks on it. No one can read “Diary of a Wimpy Teenage Vampire Part II” on a postage stamp! 2. Put the sequential number in the metadata.Make sure it’s “Bloody Sunday (Diary of a Wimpy Teenage Vampire Part 7)”. You don’t want to frustrate readers, they’re your customers. Love them. Make things easy for them–and let them know which book to buy next. Their lives hard, and they worked hard to spend the money and time to read your story. 3. Make your covers match! Anyone who has followed me for a while knows that this is something I, ahem, struggled with. (For a hilarious peek at my cover attempts check out my Goodreads page and the old editions there https://www.goodreads.com/book/show/18299288-i-bring-the-fire). When I hit “Monsters”, Part II in my series, I realized making an artistic masterpiece for all of my covers was going to bankrupt me in either time or money. So I simplified. I went to iStock and picked out some lovely background textures, and then used Fireworks to superimpose images and Viking-themed patterns on top of those textures. You can see my covers in my signature. It’s obvious all except “Murphy’s Star” belong to the same series. 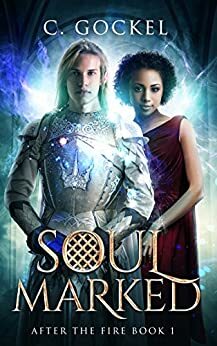 “In the Balance” is a novella that wasn’t part of the original plan. I tried to use the slight variation in the theme to reflect that. “Murphy’s Star” is a genuine stand-alone. To be honest, I could probably make the covers even simpler and cheaper and sell as well. But I’m pleased with them, and will continue the theme.